It’s been an unseasonably warm January with little snow and daytime temperatures sitting slightly above zero Celsius. It makes it hard to not think about gardening, but I must continue to be patient. Colder weather is in the forecast. 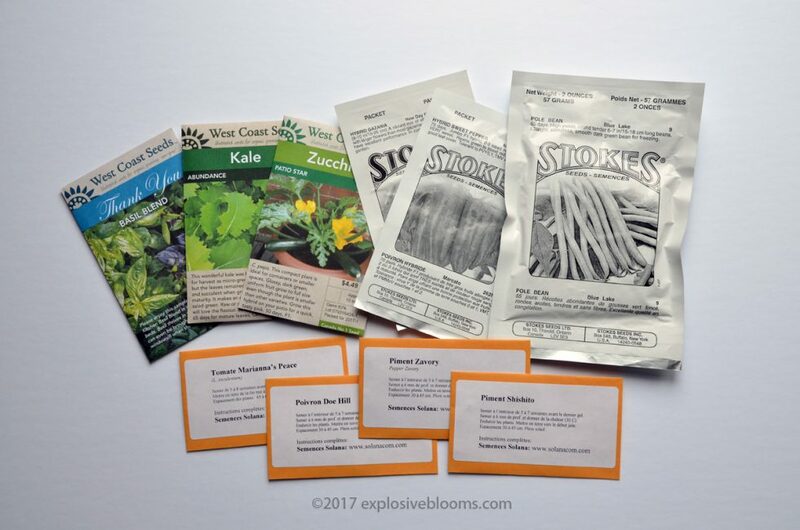 Seed starting is still too early, but it’s not too early to start planning and taking inventory of your seeds. After figuring out what seeds I needed to purchase, I placed my orders in early January, and they have arrived! I will continue to grow tomatoes, but I have some seeds from last year. This year I will purchase a cherry tomato seedling, as opposed to starting it from seed. I didn’t want to purchase the seed packet (from Stokes) because it contained way too many seeds. I’m sure friends would love for me to start seeds for them, but there would still be too many seeds, and since I will be growing a full garden this year, I also have limited space to grow for others. Last year, I seeded for my cousins, but I also did not plant as much for myself because of the 7-week road trip. It’s not so much the lack of physical space in my house, but the space under the grow lights. Without access to the grow lights, plants will not be as strong for transplant. They will be leggy as they spend their energy growing upwards to reach sufficient light. Ultimately you want stout, bushy seedlings. In addition to the Sweet 100 cherry tomato plant, my intention is to also grow more green zebra and Coeur de Boeuf (Oxheart). This year, I also intend to try a new tomato called Marianna’s Peace, described as: magnificent, large dark pink/reddish fruit with shiny skin and slightly ribbed shoulders. Dense flesh, really smooth and with a subtle, well balanced, sweet flavor. Highly praised. Non cracking, nice looking fruits. Tall, potato-leaf plants that can reach more than 2 m in height. Good production for a potato leaf. 80-90 days. I wanted to try growing golden or black pineapple tomatoes; however, they appear to be in high demand and are sold out. I’ll have to order sooner for next year. Last year I experimented with Bishop’s Crown, a pepper that is supposed to have some heat. This pepper plant took a long time to set fruit. The foliage was quite amazing – very dark green with large leaves. The plants grew taller than any of my other pepper plants, though they were all grown in the same sized containers. The fruit grows to an interesting shape (hence the name). The size isn’t particularly large. The skin is on the thicker side. My crop had zero heat, but the peppers were so sweet! It made me decide to grow sweet peppers this year again, along side my hot peppers. Sadly, I learned that hubby doesn’t really care for sweet peppers! Who doesn’t like sweet peppers, that’s weird! Anyway, I settled on Doe Hill and Marcato. It’s productive, early, tasty and beautiful. Thick flesh, crunchy and very sweet. Fruity flavor. Small rounded, flattened fruits, 5-7 cm. Compact plants, about 45 cm high. First peppers ripen around July 25th, and the plants keep on producing until the end of summer. Early, 60 days. Recommended. From the american Appalachia. Long horn type with 2-3 lobes are VERY sweet. Ripens green to blood red. Erect plants have good leaf cover. I haven’t decided which of my usual hot peppers I will continue to grow again this year, but with the sweet peppers in the mix, I will need to pare back on the hot peppers. 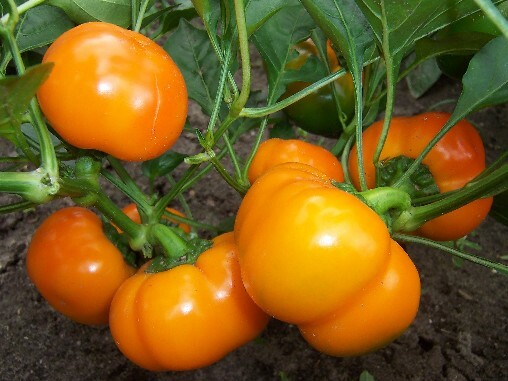 The Chinese 5 were prolific and beautiful, while the Arbol produces easy-to-dry peppers. Jalapenos are always great for pickling, but I still have jars of pickled and candied jalapenos in my basement. Cumari has always been a favourite of hubs because it’s a small pepper, unlike the regular habaneros; however the white habs are also small. I will have to have a conversation with hubs and get him to rank them. He’s the reason why I grow so many hot peppers. 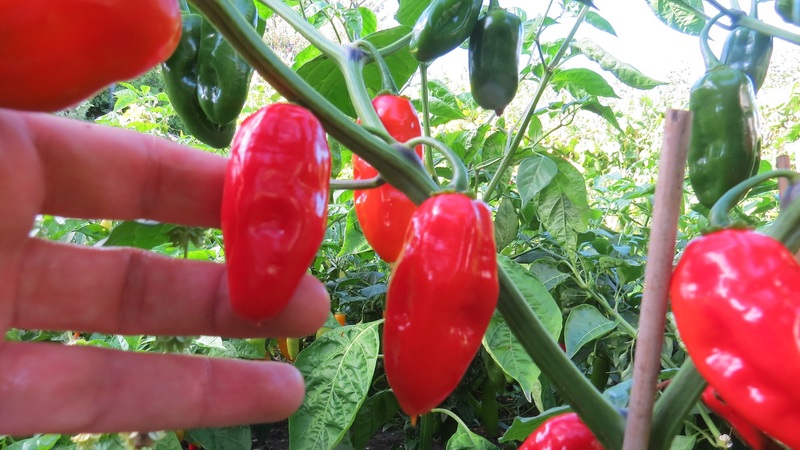 But this year, I’m also trying a new kind – Zavory, a medium heat pepper. All the tropical fruity aroma of the habanero, but without the blazing heat! Very tamed. Pods can be eaten right off the plant, without worrying about “getting burned”. Just a bit of heat. The sweet, apricot-like taste of this pepper is a great ingredient to add in a fruit salsa (mango salsa, peach salsa, etc.). Nice also in rice dishes. Pods are bright red, 5 -7 cm long. 90 days. I’ll have to figure out how I want to trellis them, but I’m excited to see what happens. I’ve grown edamame in the past, but they do not require any support. Other new-ish things I’ll have in my garden this year include Blue Lake pole beans and a compact zucchini. Although kale has been a headache for me in the past, due to leaf miners EVERY TIME, I’m going to grow it again. The difference is that this type, Abundance, is bred for harvest as micro-greens. I may just try growing in shallow trays under the grow lights. I’m hopeful that my Desert King fig will produce fruit this year. I still have four fig trees, which are overwintering in the garage. They get taller each year, making them harder to store off the ground. This year I will try to leave them in the garage until it is warm enough to put them outdoors. In the past, I have brought them into the house in late March, and they start to leaf quickly. It’s beautiful, but they succumb to sun scorch very easily once it’s warm enough for us to put them outside. The idea is that I transfer them straight from the garage to the deck so that the leaves are emerging to natural full sun, and perhaps this will prevent sun scorch. The biggest challenge I will likely face (starting) this year is how to protect/co-exist with the squirrel(s) that have now figured out how to climb onto deck.